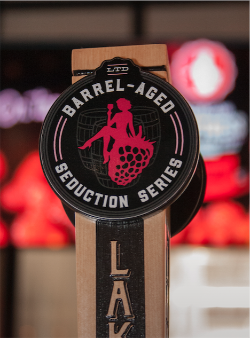 Following up on a promise made when the brewery unveiled its 2017 release calendar in November, Lakewood Brewing Co. of Garland is ready to release the first in a run of barrel-aged versions of its popular Seduction Series. Barrel-Aged Raspberry Temptress will be unleashed in draft-only form, and only at select locations beginning at the end of February. "We're excited to finally release these highly-limited beers, starting with Barrel-Aged Raspberry Temptress," says Wim Bens, president and founder of the brewery. "For this release, we used bourbon barrels from Breckenridge Distillery. It's everything you love about Bourbon Barrel Temptress with a big burst of raspberry flavor and aroma." According to a press release, Lakewood chose bourbon barrels for the initial release after experimenting with the blend a couple of years ago. Moving forward, though, fans should expect to see a variety of other barrels used for upcoming releases. "We're constantly trying to push ourselves creatively," explains Bens. "Each of our Seduction Series beers has its own unique personality, so we're interested to see how different spirits and barrels can add to that mystique." As for this release, Barrel-Aged Raspberry Temptress will be available for a limited time. "We are only releasing a handful of kegs of each Barrel-Aged Seduction Series release to the entire market," says Bens. "Get them while you can!"